RIM shares hit 8-year low | BlackBerry Blast! 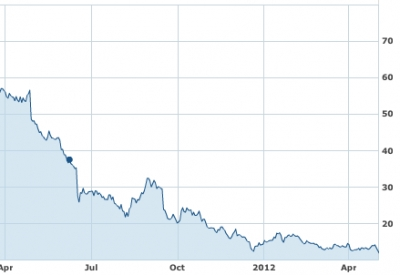 RIM's stock has been slowly losing its value and yesterday it hit an eight year low. In afternoon trading on Thursday RIM's stock hit $11.92 per share. It hasn't been that low since 2004. And, the stock has dropped 15% in just the last 3 days, and RIM just showed off its latest BlackBerry 10 prototype this week. It looks like the investing world isn't too hot on Thorsten Hein's new announcement. Right now RIM's shares are sitting at around $12.06 per share. RIM is placing its bets on BlackBerry 10, but that likely won't be enough. The BlackBerry-maker will likely need to seek out licensing deals for its BlackBerry Messenger service, and may even have to be more aggressive in playing the patent game just to survive. The problem is current management has not signaled a willingness to go after licensing deals just yet. They appear to be waiting to see how BlackBerry 10 does, but that may be too late.